Learn what the standard tuition charge is for U.S. colleges, and how Adventist University of Health Sciences compares. See how tuition and fees at Adventist University of Health Sciences match up to the average and find out what you can do to effectively get ready for potential tuition increases. The next table outlines how Adventist University of Health Sciences measures up to other schools nationally, regionally and by state. How Much Will Tuition & Fees Be for Adventist University of Health Sciences? Full-time undergraduate students at Adventist University of Health Sciences were charged $14,400 in fees and tuition for the 2017 - 2018 school year, prior to modifications for financial aid. $13,800 was the price of tuition. The remaining $600 represents additional fees. Unfortunately, this school does not provide any special discounts to residents of the state. Adventist University of Health Sciences fees and tuition is the amount billed to undergraduates for one academic year, not including room and board. Having said that, a lot of students will end up paying below full tuition after collecting financial aid as well as other reductions. View the following table to see 2017 - 2018 academic year costs. Check out the Part Time Tuition & Fees page for more information. There has been a growth of 5.1% in Adventist University of Health Sciences fees and tuition for out-of-state students in the past 5 years. Tuition grew by 5.3% and fees grew by 0.0%. This year, undergrads should expect to pay $15,130 based on current projections. Because of price increases, the full cost of a four-year degree will be $65,280, and the full expense of a two-year degree would be $31,027, not including additional charges for books, transportation, and room and board. 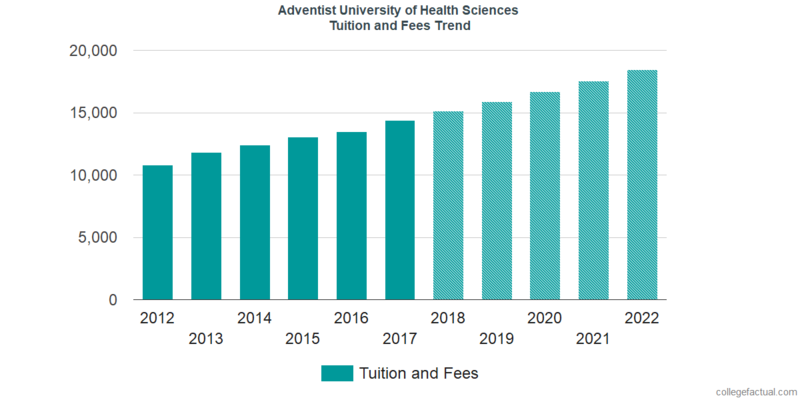 View the following chart to find out how Adventist University of Health Sciences fees and tuition might increase in the future. Take note of how much college fees and tuition is rising every year. At a lot of schools students will end up spending more money on their final year of college compared to what they did for their first.